A week or so ago the Oregon Shakespeare Festival, one of the oldest and largest US Shakespeare festivals, announced they have commissioned “translations” of 39 Shakespeare plays into contemporary English in order to make them accessible to the public. I first spotted the argument on the US website SHAKSPER, the Global Elctronic Shakespeare Conference, where a number of comments have been posted, mostly deploring this move. I wasn’t aware that this story had gone beyond the world of academia until Monday morning when Radio 4’s flagship news programme Today featured it with an interview with Andrew Dickson, author of Worlds Elsewhere: Journeys Around Shakespeare’s Globe, and Greg Doran, Artistic Director of the Royal Shakespeare Company. It begins 2hrs 26 minutes in. It was an interesting, and rather surprising discussion, Andrew Dickson actually regretting that as he has not experienced Shakespeare in modern English. “I’ve never encountered Shakespeare as a contemporary”, by contrast with people from other countries for whom Shakespeare always speaks with a modern voice. Doran took a different view, counting himself lucky to be able to read and understand Shakespeare’s language as it was written. Although Shakespeare is “robust enough” to stand up to being translated, Doran is, not surprisingly, unconvinced. “Translation gets the sense and there’s so much more going on” in Shakespeare’s dense language. With translation a choice has to be made between “meaning, pace and poetry” and modern versions are in “flat, banal, everyday English”. 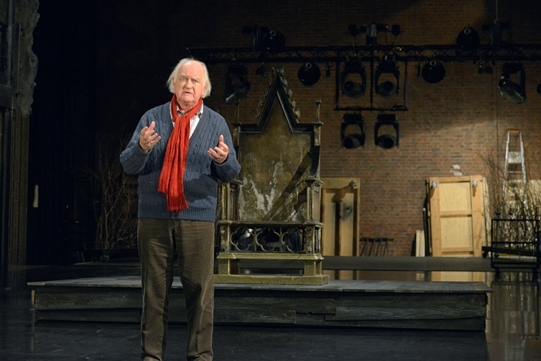 Both men talked about performance: Doran suggested that it was worth taking the trouble to learn Shakespeare’s language, but that many of the difficulties could be erased if the plays were performed by skilled and experienced actors. Dickson suggested that every performance was in its way a translation because of the thousands of choices made by directors when interpreting Shakespeare’s works. 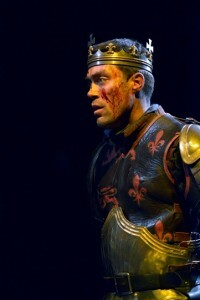 I happened to go to Doran’s production of Henry V later on the same day, and couldn’t help thinking about what had been said. Doran’s productions always put stress on the language rather than the visuals, and this time he’s often chosen to leave his actors alone on stage with nothing but the words, as with Henry’s speech to the Governor of Harfleur. In order to persuade the Governor to submit and admit the besieging English army, Henry usually surrounds himself with his commanders who put on a show of force and back up his threats of violence. Printing their proud hoofs i’th’ receiving earth. For ’tis your thoughts that now must deck our kings. Going back to SHAKSPER, one of the contributors to the debate was none other than James Shapiro, who I can only think must have written his article en route between Stratford and Washington DC. If you’d like to read the rest of Shapiro’s case it’s there on the SHAKSPER site, and for the sake of balance, here’s another view. 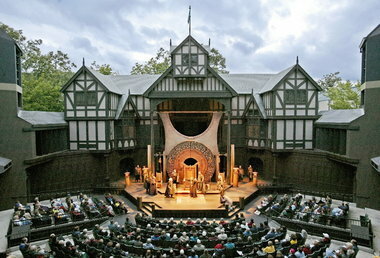 This entry was posted in Legacy, Shakespeare on Stage and tagged Alex Hassell, Andrew Dickson, Gregory Doran, James Shapiro, Oliver Ford-Davies, Oregon Shakespeare Festival, SHAKSPER. Bookmark the permalink. 2 Responses to Shakespeare lost in translation? It’s bloody ridiculous. Take away the genius of the original language, and Shakespeare becomes Nashe, Munday, Chettle, Chapman or Dekker……..just another dramatist….. as you mention, Shakespeare’s plots hardly marked him out for genius……surely what separated Middleton, Beaumont & Fletcher from the also-rans was THEIR LANGUAGE. Well, whatever……….for the sake of ‘convenience’, the Yanks have ‘modified’ the English language as a whole………….so we should not be surprised when they ‘modify’ the Bard ……..because they’re too damn lazy to work at absorbing the words as they were written. It’s up to them I suppose – but I wonder, how would they feel if Brits started to ‘translate’ Walt Whitman’s poetry?